For the last couple of weeks, the Portland area has been experiencing some really cold weather; temps down to 18 degrees at night, gusty East wind, but no rain. But last Tuesday, we got snow! It was fabulous. The whole City of Portland ended up shut down, because with the ice and snow, it was very difficult to get around. Here at my hale, it was beautiful. I looked out over the valley, which was covered in white. There was no traffic on the roads, which were too icy to navigate. Everything was hushed and quiet. Snow was everywhere. White filled my vision. 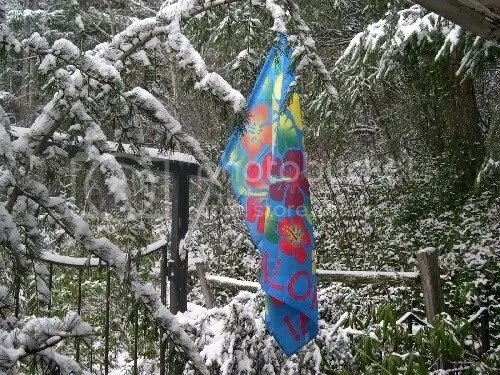 Except for this, aloha in the snow.